Surgery | Adventures of a Funky Heart! Hearts in the fast lane! London’s Great Ormond Street Hospital (which has the unusual acronym GOSH) had a problem. One of the most critical times in heart surgery is the transfer – the process of moving a patient from the operating room to the recovery room. It is not a simple task of just moving the patient from the operating table to a gurney and rolling it down to the recovery unit; monitors have to be unplugged and reconnected to portable equipment, IV’s have to be prepared for transport, and any life support must be switched to portable units. It is a complicated, involved job that has to be done perfectly – the first time, and every time. Patients weren’t doing so well, and some were running into real problems after surgery, so GOSH Surgeon Marc De Leval asked a group of “Human Factor Specialists” to study a series of Arterial Switch operations and try to determine what the problem was. The Arterial Switch is one of the more difficult Congenital Heart Surgeries and one that seemed to be causing more than its fair share of problems. The evaluators determined that both the surgical unit and the recovery team was up to the task; the problem was based in the transfer. Too many things to do, too many things that could be missed, and it could be slow. But it had to be done slowly and carefully, because if you missed something, things could go very wrong for the patient. So even though they recognized the problem, the surgeons of GOSH seemed to be unable to do anything about it. Until the day when a surgeon and the head of the Pediatric Intensive Care Unit were watching TV. What they needed, they realized, was a team approach – a group of people who could work together to get the job done correctly and the patient on their way to Recovery. So they asked a Formula One race team for help. Americans (especially those of us in the South) are more familiar with NASCAR racing. A Formula One pit crew is just as fast as their NASCAR counterparts – and considering that Formula One allows more people working on the car simultaneously, they are probably better. So the race team came in, and spent some time with the hospital staff. The speedsters made many suggestions, and while not all of them could be implemented, several important ones were: One person was placed in charge of the transfer process and everyone involved was trained on their new task. Problems don’t just happen, they learned. A small error that slips by can turn into a larger problem, which can become an even larger problem. So if the small problems are eliminated, the larger problems should not occur. They were also trained to have clear, concise plans on what to do if something went wrong. “Plan B” works best when everyone is familiar with what Plan B involves. So far, the “Pit Stop” approach is working. GOSH reports medical errors that occur during the transfer period are down 30%! My pacemaker battery wears down pretty quick. Not because I am that active (What do you mean, you don’t chop down a dozen trees with a steak knife every morning?!?) but because of a combination of things. I am “100% paced” – meaning my pacemaker is on the job all of the time. Also, my pacemaker is not in my shoulder. Usually the controller unit is in your shoulder with the leads traveling down the Superior Vena Cava into the heart. (CLICK HERE for a diagram of the standard pacemaker placement.) So my pacemaker is in my abdomen with the leads leading up through the Inferior Vena Cava. 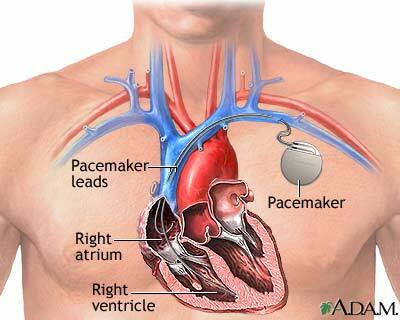 As you look at that pacemaker diagram, you see that the pacemaker leads extend down into the Right Ventricle. That’s not happening in my heart – remember, with Tricuspid Atresia you don’t have an opening where the Tricuspid Valve normally is. So my pacemaker leads end in the Right Atrium, and the pacer needs a bit more of a “Jolt” to push my heart along. So I usually have to get my battery replaced every three to four years. The initial surgery is hard, they do have to cut you open. The replacement is easier – they make a two-inch incision above your control unit, disconnect the leads, and remove it. Then they attach the new unit, test it, and if all is well they sew you up. Long time readers will remember that my doctors are worried about what might happen if I am put to sleep, so they give me a sedative. I call the sedative Happy Juice for a reason: I’m awake and can talk (and make pretty good sense!) but I am flyin’. Let me tell ya, Happy Juice is some good stuff, and next time I’m going to ask for the recipe! Of course, the Happy Juice will wear off in a few hours, and then I won’t be quite as happy. So before I was discharged the Outpatient OR gave me a prescription for some painkillers, and that is when the trouble started. Sometimes ordinary things cause the strangest reactions in people. I have a friend who will not drink Orange Juice – it makes him hyper! A small glass of OJ hits him like a sugar rush, and you almost have to sit on him to get him to be still! Now usually, meds work the way they are supposed to when I take them, but this painkiller never killed any pain… all it did was make me sleepy. Ugh. Sleepiness wasn’t helping, because I was hurting so bad that I couldn’t lie down or sit up without help. And because the incision was in my abdomen, I couldn’t even roll over. I was trying to sleep sitting up in a straight-backed wooden chair, and a local ER doctor wouldn’t help me. Apparently he thought I was trying to work the system, since his advice was to “grow up.” I had to go back to my Cardiologist in Atlanta to solve this problem. Thankfully he’s seem me enough over the years to realize that I wasn’t kidding around or trying to scoop some free drugs. He changed the prescription and for the first time in a week, I could lie in bed and sleep. At one of my worse moments I declared (loudly) that if getting the pacemaker changed was going to hurt like this, then the next time I would just let the battery go dead and take my chances. Thankfully that was just the pain talking, I haven’t lost my sanity. But maybe I can get lucky and get one of those new pacemakers that generates its own power! Researchers at Princeton University are working on a flexible rubber sheet that can power a small electronic device. The rubber sheet is coated with ceramic nanoribbons and generate energy by movement. In theory, a pacemaker control unit could be placed near a lung (the two current pacemaker placement locations – shoulder or abdomen – should do the trick) and as you breathe, the motion of your lungs would generate the power needed to operate the device. Meanwhile, they are taking a slightly different approach at the University of Michigan. Tiny generators can “capture” motion and use them to generate power – more than enough to power a pacemaker. This really isn’t new: There are already “Self-winding” watches that create their own power from the back and forth motion of our arms as we walk. This generator can use vibrations from smaller, less rhythmic motions to create their power. The problem right now is energy storage – the research team needs to find a way to store the power generated for the times when motion is low. I know that I would hate for my pacemaker to run dry just because I was sleeping! Cut ’em off at the pass! It’s a common scene in old Western movies: The good guys are in hot pursuit, but the bank robbers are getting away. “Quick, let’s cut ’em off at the pass!” someone shouts, and all the good guys gallop off through a shortcut. A few moments later, they’ve managed to get ahead of the evildoers! For ten years now, Children’s Hospital of Boston has been working on cutting Hypoplastic Left Heart Syndrome (HLHS) off at the pass – by doing heart surgery while the baby is still in the mother’s womb! One of the early signs of HLHS is Fetal Aortic Stenosis; a small Aorta present before birth. (This can be detected through a Fetal Echocardiogram.) Boston Children’s has developed a procedure in which a probe is inserted into the mother and passes through the womb, into the unborn child, and enlarges the Aortic Valve. This is known as Fetal Aortic Valve Dilation. An article in the June 2010 issue of Congenital Cardiology Today details the procedure and reports on an analysis of 70 attempts to repair the defect. 52 of the procedures (70%) were “technically successful.” If the Left Ventricle is small (and it almost always is) when the operation is done, the Ventricle will not grow. However, it will support growth of other Left Ventricle structures and HLHS can usually be avoided. Aortic regurgitation (backward blood flow through the Aortic Valve) happened in about 40% of the cases. And unfortunately, death occurred 13% of the time. But the good news is we are starting to be able to fight a severe Congenital Heart Defect before the child is even born – and stopping a severe Congenital Heart Defect almost before it starts! The question we should be asking isn’t “Is it right to consolidate centers that offer Congenital Heart Defect (CHD) surgery in favor of larger centers?” but rather, “How do we get a CHD patient that presents at a non-surgical facility to one of the large surgical centers?” This question really has no good answers. At 11:21 PM last night, a mother delivered a child at a smaller facility that does not offer Congenital Heart Surgery. The child, a five-pound, six-ounce boy, appeared to be showing the signs of Cyanosis. There has been no indication of any potential for cardiac problems noted in the medical records, and the child was immediately evaluated by the Cardiologist on staff. The Cardiologist noted the presence of several unusual heart sounds, which along with the Cyanosis, lead him to believe that the child may very well have a Congenital Heart Defect. However, he is not sure of the exact diagnosis. For further testing the child needs to go to a facility with advanced imaging equipment, and there are two hospitals that can provide this service: Hospitals A and B. Hospital A has imaging equipment but no Congenital Heart surgeons; Hospital B (304 miles away) has both. The Cardiologist chooses Hospital B – perhaps the easiest decision that will be made all night. Meanwhile, the parents have been informed that there may be a health issue with their child, and they may need to travel to a larger facility. In a small room with a Hospital Counselor, they discuss their options, which at the moment are largely unknown. In a few moments the Cardiologist enters the room and states that their child may have a serious heart problem but he is not sure. He recommends the child be taken immediately to Hospital B and possible surgery. Now our questions multiply: Is the infant stable enough to fly? If yes, is the weather suitable for helicopter transport? Is a helicopter available? What kind of medical skills will be needed for the journey? Does the hospital have someone who is qualified to provide that level of care? If not, can someone be found quickly? Is the mother able to travel? If not, how will the mother travel to Hospital B when she is well enough to travel? These are the medical questions that need to be answered. Non medical questions could include anything from how will the family arrange for their clothing to be delivered to them at Hospital B, where will they stay, do they require any financial assistance, and what will happen to their vehicle? After all, when they arrived at this hospital, they never expected anything but the miracle of childbirth. Now they have been thrown into a world they do not want to visit, but have been informed that this will be their permanent home. At 2:13 AM the phone rings in an office of Hospital B. The person who answers the phone knows that the Cardiologist on Call has been discussing a case with a fellow doctor at a small facility and that the child in question is being transported by helicopter. The phone call informs him that the helicopter about fifteen minutes from landing. In turn, this person calls the Catherization Lab, Hospital Social Services, and Cardiology to relay the news. With great reluctance he calls the number of a home near Hospital B. Apologizing again for waking the family, he tells the woman who answers the phone that the helicopter is near. The woman represents the local Congenital Heart Defect support group and is a Heart Mom herself, and has volunteered to work with new parents and try to guide them through their first journey into the CHD world. Just before leaving the house she looks into the room where her young daughter sleeps, her personal reminder of why she answers the phone in the middle of the night. Obviously, this story is fiction – or it may not be, as 1 out of every 125 children are born with a Congenital Heart Defect. 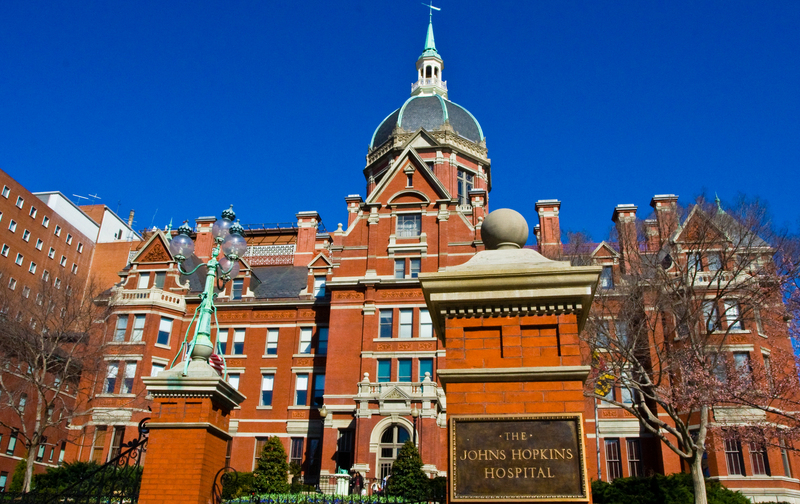 Many of them are born at smaller facilities that offer little to no Open Heart Surgery experience, and need to be relocated to “Hospital B” for evaluation and possible surgery. In my opinion, asking if closing smaller facilities in favor of larger, more experienced hospitals is the wrong question. We need to concentrate on smoothing the transition from smaller hospitals to the larger centers where help is more readily available. Isaac is having surgery today at Duke Children’s Hospital! I met Isaac and his mom at the Saving Little Hearts CHD Symposium I attended last year, he’s a pretty cool kid. He has to be at the hospital at 8:30 AM Eastern Time (1230 GMT) and he’s the second scheduled operation of the day. I’ll be updating when I find out what’s going on, so keep refreshing this page! 11:04 AM: No update as of yet. Surgical schedules do run late, I’ll keep checking! 12:48 PM: First update! Things were going really slow – Isaac was called back to the Prep Room at 11:30 AM! He’s finally in the Operating Room. 1:14 PM: Surgery has begun! 3:23 PM: Surgery still going on, everything seems to be under control. Isaac’s mom is beside herself waiting! Keep thinking about both of them, please! 6:21 PM: THE SURGERY IS OVER! The Surgeon said everything went exactly as planned. Isaac is on a ventilator and is in Recovery; his mom is on her way to see him right now! She’ll probably report once she sees him; if nothing unusual is going on I’ll end this post after that update. 11:48 PM: A final update from Isaac’s mom: HE’S PINK!